HomeMarketing Fleur de Passion, The Incredible Journey. The 33-meter majestic Fleur de Passion has arrived in Cape Town! 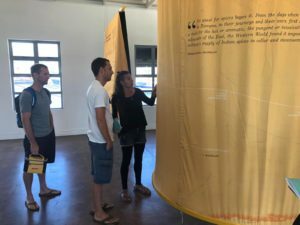 In the final phase of its four year long expedition circumnavigating the world, using Ferdinand Magellan’s route as its guide, she has found her way to the V & A Waterfront on the tail end of her journey. The Fleur de Passion route. Why is she so special you may be thinking? The team behind the Fleur de Passion have been working tirelessly over the past three and a half years to weave together scientific, cultural as well as educational work across the globe in a bid to try not only raise awareness for our dear oceans, but also strive towards protecting them, in their ocean mapping expedition. Amazing drawings from cartoonist on board of their work on the boat. The boats mission, to create a meaningful impact concerning the health and protection of our oceans, is carried out through various different mechanisms. Regarding their scientific work, they have been partnering up with various universities, governments and other individuals to carry out data collection. 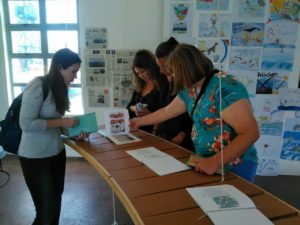 Their projects have ranged from monitoring the sounds of the ocean and the impacts that humans have contributed towards this, making use of citizen science for coral watching and monitoring, and more! Click here to get more details on these projects. 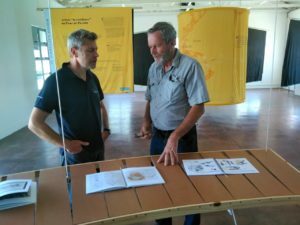 One of the most interesting projects that they are involved in which has certainly caught our attention, is their micro plastic collection and analysis done with a manta net. Manta trawl, use to collect micro plastics. 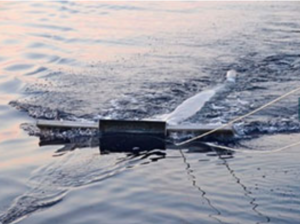 Similar to the one that Boaz is currently using, the mesh net catches the micro plastic particles, where the samples are later sent to a laboratory to be analysed and recorded. In this way they are able to map out and record the density of micro plastics found around the world. This kind of work is essential to helping understand the depth of the problem as well as find targeted solutions to different issues found in different places. 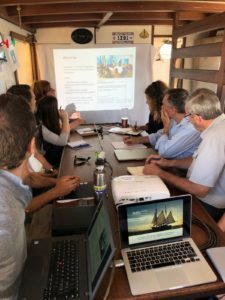 Our team at Yacht Boaz, as well as Cape RADD (Research and dive development), was fortunate enough to be able to sit down with the Fleur de Passion and exchange ideas, missions, findings and incredible experiences. Fleur de Passion, OceanEye, Cape RADD, Yacht Boaz & others learning and sharing. Community is dear to the Boaz mission, and through creating a network of likeminded people and committed individuals massive change can be achieved. Through working with, alongside and in exchange with other organizations, people and boats conducting similar work we can learn, share and grow with one another. 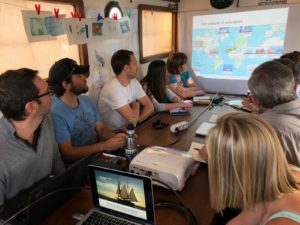 The discussions we were able to have with the Fleur de Passion and the things we were able to learn from their three and a half year voyage have been most illuminating. Samuel (Fleur de Passion) & Keith ( Boaz) in deep discussions. 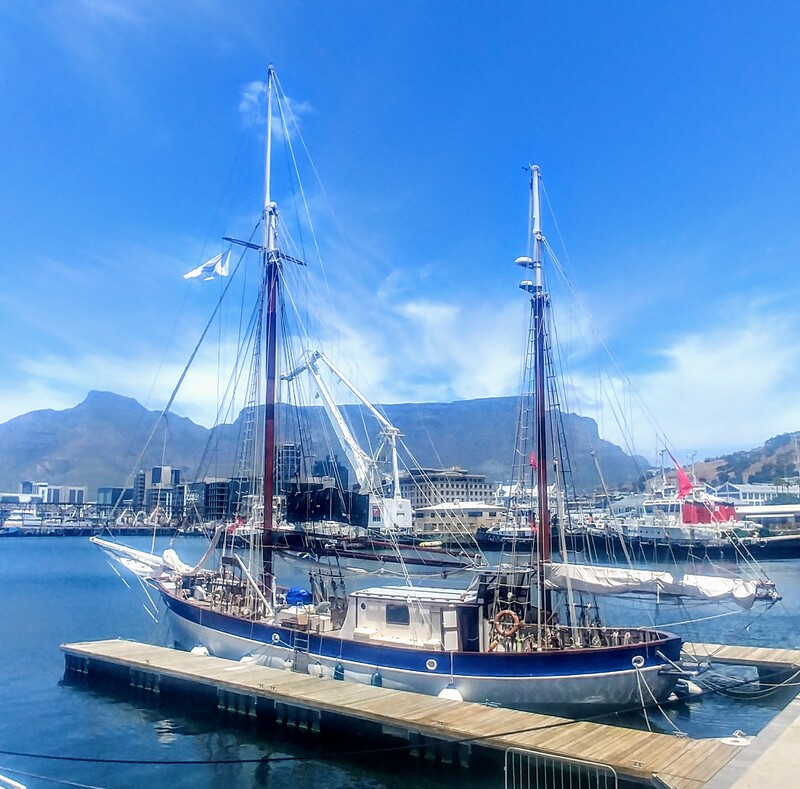 The Fleur de Passion is be docked at the V & A Waterfront, Quay 6 (outside the table bay hotel ) until 24th January 2019. Go have a look for yourself. Entrance is free, there is a donation box (of course) , hour long tours start from: 10am – 12pm & 2pm – 6pm. 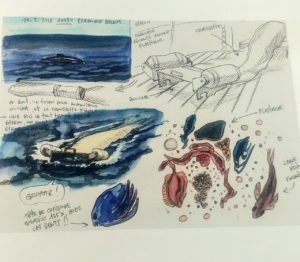 They not only are open for people to come on board and learn about what they do and how they do it, but they also have an incredible exhibition. The exhibition “Our Spice Islands” is located near the boat. It is also comprised of beautiful illustrations drawn by the various artists they’ve had on board. The teams having a look at the incredible exhibition. This is defiantly a must see! To find out more information visit there website. Here.